The emerging field of science concerned with the possibility of life beyond the Earth has variously been dubbed astrobiology, exobiology and bioastronomy (and xenobiology – the biology of the foreign or strange – is sometimes used as well). So as Christian de Duve remarks in his foreword to this Encyclopaedia, this field has the rare distinction of enjoying three names and as yet not a single known example of its own subject matter. But astrobiology is still a young field of science, and whilst some of it’s component fields have a long heritage and are well-matured, others are in a state of rapid flux as new results and discoveries flood in. As the editors point out, the publication of a dedicated encyclopaedia often marks the establishment of a loose collection of related topics as a definable field of research. 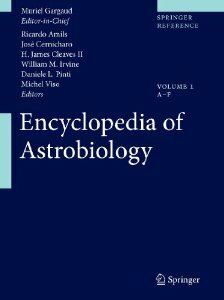 With this Encyclopedia of Astrobiology, then, Muriel Gargaud and his fellow editors and authors have firmly planted the flag of astrobiology in the scientific landscape. Stretching to three thick hardback volumes, the Encyclopedia of Astrobiology is certainly comprehensive. Many entries are pretty substantial and constitute a mini-review article on a particular topic. These often stretch to several pages, with embedded tables and full-colour figures, and include a full reference bibliography and list of related entries in the encyclopaedia. Other significant, but broad, topics, such as ‘Common Ancestor’, are defined briefly before the reader is referred to full entries on the component topics. Encyclopaedia entries within my own field of knowledge are authoritative and cover all the main points, and are well-supported with carefully chosen graphs and figures. It’s always worrying when there appears a clanger of an error in the first pages of a reference book (the Foreword estimates 30 billion sunlike stars in our galaxy, 100 billion galaxies in the Universe, and so calculates 3,000 billion sunlike stars in the Universe), but the rest of the Encyclopaedia really is first rate. Priced at £629.50, this perhaps isn’t a reference work you’d want to fork out for your own bookshelf, but it certainly is well worth requesting your academic library to order a set. A very attractive feature that Springer also offer is an online ‘eReference’ version, which will save you a lot of page-flicking and provide a wikipedia-like resource for astrobiology. Highly recommended.